Been off the radar a wee while. Sorry. Not the best of reasons. I was a few weeks ago struck down with a massive (not bragging, it's a medical term) pulmonary embolism. Good news is I survived. However things are still on road to recovery and a may need to be taken a tad more slowly in future. At worst a few doses of listed rat poison a day. Could be a lot worse. But I share mainly as a caution to all you keyboard warriors out there. No spring chicken me, but I was deemed 'young' for such a thing. And they are pondering causes. No obvious medical indicators... haven't flown for years, non-smoker... etc. However, they are rather keen on the fact that I sit at a desk, looking at a screen, typing all day. Hard to avoid these days, but not good. So... take it from me... frequent breaks... get up, take a stroll (or in complement such as the daft interim measure in the photo... 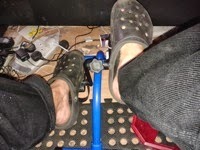 I am wondering about designing a pedal-enabled seat that avoids DVTs whilst letting you power your PC) and... don't cross your legs! (this was impressed on me, with a slap, by any nurse walking past the end of my bed - apparently it's very bad). As Spock would say... 'live long and prosper'!